Dubai, UAE, January 09, 2019: Whether you're heading to a meeting in the boardroom, unwinding in your casuals at the local pub, or standing at the altar ready to say your vows, a stylish watch can add a touch of class to just about any look. 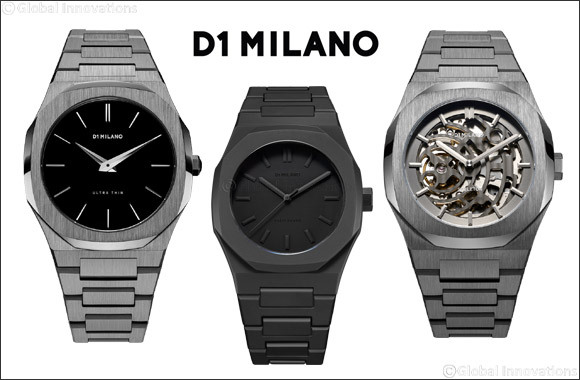 D1 Milano brings to the fore it's astounding collection of timepieces in the new year for the discerning men and women. Classic yet contemporary styles in nature and key models from the line that flew off shelves in 2018 are making a big come back and for good reason. Loved and applauded by the fashion conscious crowd, these D1 Milano bestsellers are here to stay! One color is all it takes for subtle style! A cult favorite, this model represents a strong and total monochromatic personality, featuring a soft touch polycarbon soul and lightweight character. Details count on this classic modern. Ideal for a stylish lad or a trendy lady, the Ultra Thin features a 40mm case for men and 38mm for women, only 6mm thick, fitted with a new stainless steel bracelet adding an oomph factor to your style! Crafted from a 41.5mm stainless steel case with both automatic and skeleton movement the design comes with a natural rubber strap and stainless steel bracelet option. Available in both Automatic and Skeleton dial options; the P701 stands out from the crowd making a real statement whilst being incredibly trendy. Want to know the best part? The bestsellers can go with just about any outfit. Pair one with a three-piece suit for that 007 vibe or go with jeans and a tee for the laid-back, classic cool look. One thing's for sure, the timepieces are bound to make you stand out. Style yourself with a trend which is not only classy but one that make heads turn wherever you go. Creating revolutionary designs being the brand's core value, D1 Milano is your perfect companion that helps you make a strong statement without compromising on comfort.